The easier way, of course, is not to let my work be prayer. It’s far simpler to zone out while doing the laundry or the dishes than to move through the motions mindfully. It’s more satisfying to grumble about paying bills or cutting kids’ hair than to approach it as a loving act of service. It’s even easier to jump into the email inbox and the day’s to-do list than to honor the professional work I do as sacred. But the stubborn truth is that it’s all holy, this everyday mix of action and reflection, creation and repetition. God already blesses work as good; it’s up to us to see the same. Maybe we miss it when we call it “work,” when we file it under obligation or drudgery. Maybe if we called it all “prayer” – making breakfast or giving baths or compiling spreadsheets or sitting through meetings or running errands or mowing the lawn – maybe then we would begin to understand how God’s eyes see us. I noticed a few weeks ago – while stuffing the day’s umpteenth load of laundry in the washer, then scrubbing all the pots from last night’s dinner, then hustling upstairs to help the potty-trainer in the bathroom – that I had marked each of these spaces with a gentle reminder. A small shimmer of beauty next to each place of dirty work. Maybe I needed to remember that each one was holy. In the laundry room, two postcards from the L’Arche community where I worked in France. I remember cutting carrots with Daniel, washing dishes with Monique, bathing Claude and dressing Bernard. And I’m overwhelmed at the memory of how holy that hard work was, how I knew God was there, too. I re-member myself back into the way of small things with great love. 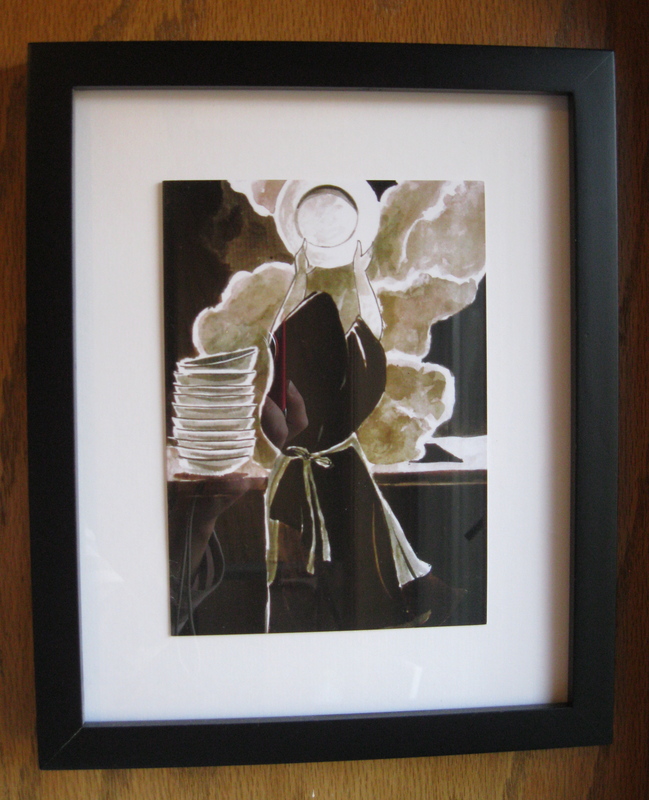 In the kitchen, a print of Saint Therese lifting high the plates of the monastery as an offering to God, letting the steam rise like incense. Washing dishes is a dreaded household chore for me, so I need a nudge to see the prayer in this necessary work. I remember all the plates that have been washed so that I could eat – in restaurants or cafeterias or homes that welcomed me as a guest. And I load the dishwasher with a lighter heart, grateful for a kitchen full of food to eat and hungry children around my table. I re-member myself back into the faith that breaks bread and shares with the hungry. 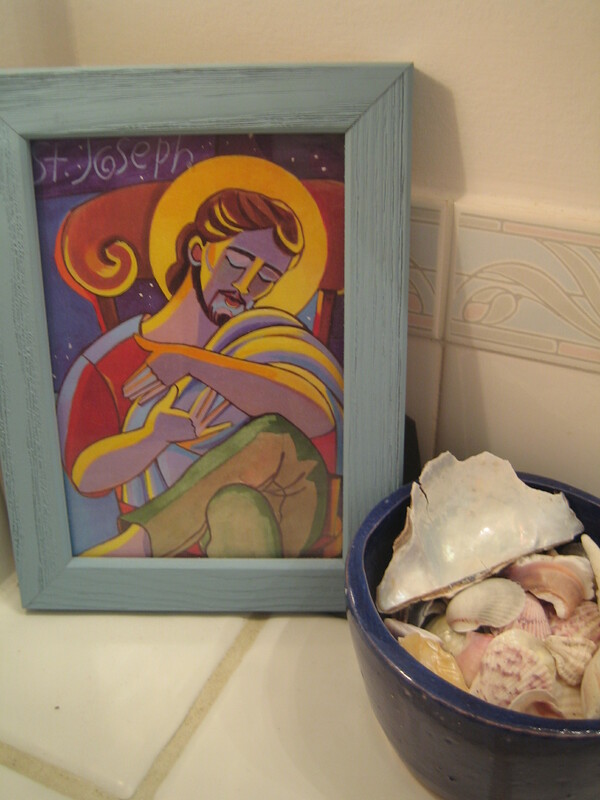 In the bathroom, a picture of Saint Joseph cradling his newborn son, a father immersed in his late night work. Whenever I’m pulled from warm bed and soft sleep by a boy with soaked sheets or a hacking cough, our trip to the bathroom is bathed in more than the nightlight’s glow if I glance at the kindred spirit on the counter. I remember all the nights that my parents sat up with me when I was sick and surely rocked me back to sleep a thousand times before my memory sealed it to heart. And I wipe my boy’s nose or bottom or feverish forehead with more compassion and less impatience at my own rest lost. I re-member myself back into the love that washes feet and touches the sick. Because maybe all this work is prayer, too. I think sometimes people forget that one of the main reasons we exist in tne created order — apart from loving and worshipping God — is stewardship. “Stewardship” is a wonderful and beautiful thing — taking care of the stuff/people/relationships/creatures/places God gives us. Thing is though? That also means a lot of hard and thankless work. That’s holy too — not just taking time to be intentional to use the mindless chores as prayer time, but offering our work (as a piece of ourselves in sevice) to God for his glory and his use.